Read the May 8, 2014 Chico News & Review article about The Stream Team's 11th year of monitoring here. Tune into KZFR 90.1 radio on the second Thursday of each month (7:05-7:15 am) Five-Mile and Then Some. Please join our network of Stream Team Volunteers, and help us gather technically robust environmental information needed to protect the ecological health Big Chico Creek! Volunteers provide a snapshot of the health of Big Chico Creek by collecting data at ten different sites during each event. Each team typically monitors one or two of the sites per event. Training is provided. Clean water is a vital resource we are all willing to protect. Healthy creek systems like Big Chico Creek help maintain safe drinking water, avert floods, and also provide habitat for fish and wildlife as well as intrinsic scenic value for our community. It is important to understand the current status of small, but important, water bodies like Big Chico Creek to track the cumulative impacts that can stress aquatic systems and impair their beneficial functions. Non-point source pollutants that often flow from the land into creeks include soils, synthetic materials from our roads and automobiles, fertilizers, pesticides, nutrients, sewage leaks, and animal wastes. 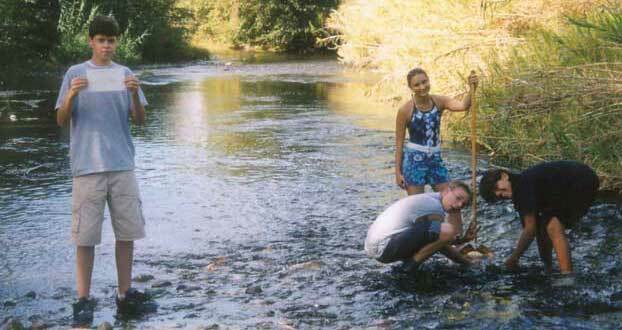 Creek monitoring provides useful baseline information that can be used to track these potential impacts. Why Rely On Citizen Volunteers? Citizen volunteers have specific knowledge and expertise about our local environment and often have critical access to areas within the watershed that would otherwise be inaccessible. Their involvement also has an important collateral impact in reducing urban pollution entering our waterways through the volunteers’ improved understanding of the ecological function of creek systems and pollution prevention measures, as well as their increased participation in watershed stewardship and resource protection efforts. They are also very dedicated and have proven to be capable of accurately and precisely performing monitoring tasks, thus ensuring that data quality objectives are achieved. Without their dedication, this valuable data would not be collected. #9. Your feet Get Wet! Copyright © The Stream Team. All rights reserved.